Welcome to my second hand store. Here I sell my personal collection of very gentle used designer clothes, shoes, accessories and bags. A winter jacket, warm and exclusive out of ordinary. 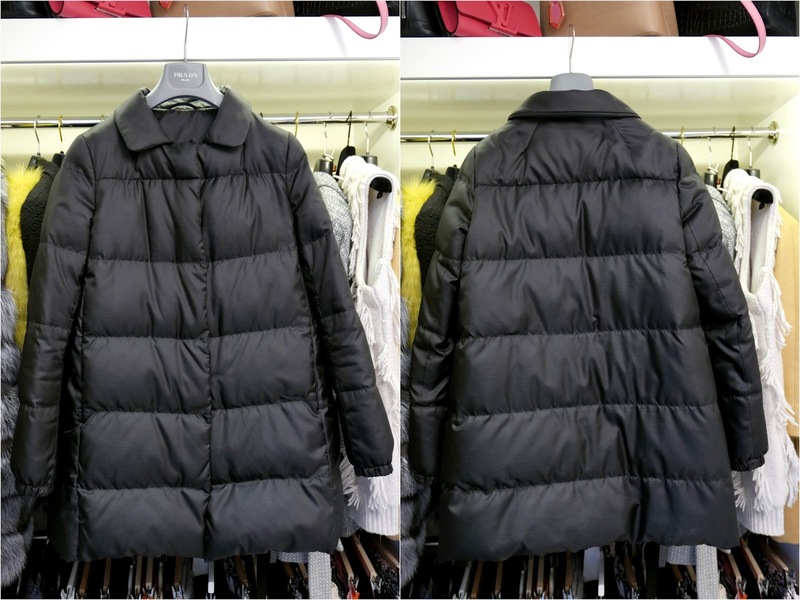 When you need to be warm, but still want to look fashionable this PRADA jacket in shiny black is perfect. Used about eight times, no traces, and a time classic in your closet. See it on me HERE. Price: 3200SEK or 350EURO , (new 9000SEK) and I'll stand for word wide shipping. For serious buy, email me at stina_auer@live.se and expect an email back with paying instructions. Just a short note to tell you how this is working. When you send an email for a buy, expect a rather quick response back from me with paying instructions and If I haven't heard anything from you in an hour or so - the buy is still open for someone else. There's no Open Buy or refund in my Vintage Store and all items are bought in the status shown on the pictures. Click on the pictures for enlargement and ask all questions before buying. All parcels are sent without tracking number with normal post in padded envelops or boxes except for products costing more then 5000SEK, they are sent with tracking number and insurance. I can not be responsible for lost or damage gods. No money will be refunded by this cause. If you would like your item that cost less then 5000SEK to be sent with tracking and insurance outside Sweden, please add another 100SEK to your payment and it can always be done. Please feel free to ask questions if necessary. Stylish toddler and baby clothes! Click on the picture and we'll take you there! All baskets sold are sent using economy class and without tracking number. Since there's hardly any profit on the bags, the cheapest delivery is chosen. Delivery time should be around 5-11 days depending on your location.